70 Responses to Welcome to Stuff Your Stocking Blog Hop! I honestly love the Christmas candles in the window the best. I enjoy sitting in the dark and have their light shining on me!!! Marie – Oh, I didn’t even think of those. They’re my favorite too! I love walking around the house with just the window and tree lights on. *sigh* Yep, miss those too! I like the tree being up. The kids like putting up the little Christmas village. Katy – I have a Christmas village too. All little lights in the window. 🙁 I put it on my desk so I can look at it all the time. Victoria – I’m so glad you stopped by today! I have several sentimental favorites: My father loved cardinals, and I have his collection of cardinal ornaments. Also, I collect Santa’s. One small one sits over the edge of a table or mantle, with his knees crossed, hands clasped at his knees – just like my father used to sit. Diane – Oh, the cardinals must look beautiful on the tree. My mother always insisted on having a bird in the tree for luck for the coming year. And who wouldn’t love all those Santas around the house! My favorite decorations are the Chirstmas lights. They’re so pretty. My favorite Christmas thing of all time though is my kids excitement. There’s nothing better than seeing their happiness. Jennifer – I love driving the streets and seeing everyone’s lawn decorations are just beautiful. And you’re right, there’s nothing like the joy of a child at Christmas. Michelle – I have some stocking holders, but haven’t had any place to put them for a long while. Mine don’t sound as pretty as yours with lights in them. Merry Christmas. I have the 3 wise men. I used to put them under the tree but my dog thinks they his toys, so now I put them on the fireplace mantel. Renee – Funny how we have to decorate around our pets! Merry Christmas to you. Amber – Oh I’ve seen statues of Santa and baby Jesus and I think that’s so sweet. A blending of the season that is so nice. And I didn’t even get into my favorite foods this time of year … there are too many to count! Helen – there’s definitely something magical about houses decorated with white lights. Every year my family takes a drive around the neighborhoods looking at all the beautiful Christmas lights. I love snowmen! They are my favorite decorations of all. Thank you for the giveaway. Have a safe & happy holiday season! June – Aww, they are adoarable! They have some really cute ones and they all look so sweet. I hope your holidays are magical as well, thank you. I just moved into a new house in the past few weeks. I am still unpacking boxes of regular stuff and haven’t put up any decorations. I’m so sick of unpacking that I may skip decorating for Christmas this year. I miss the twinkle lights most of all. Stacie – Unpacking is such a CHORE! But congratulations on the new house. I hope it means new beginnings for 2012 for you. Yeah, finding the Christmas decorations would be low on my list as well. I hope you have a wonderful Christmas. I love the Christmas tree. And candles. The rest I can do without, but a tree and candles are nice to have during the holidays. Rain – There is something about candles that just seem to fit the season, I agree. *sigh* I do miss my tree. Thanks for stopping over. I did have a few favorite holiday decorations, but I lost them all when I lost my home in the EF5 tornado that hit my hometown back in May. So I’m starting over again with everything. My years of book collections, bookmark collection, all my lighthouse postcards and everything else I owned. We all made it out alive so I can’t complain too much. I think the saddest part of losing my decorations are the ones the kids made for me over the years, I really miss them. Linda – Oh, I don’t even know what to say. The memories that are lost when something that devastating happens are the most difficult. And though it’s true, you are all safe, it’s hard not to grieve the small things that you can’t replace. I hope you have a very blessed Christmas and you find new “favorites” to decorate your tree and your home. Lisa – Don’t you love sharing traditions with your children? May your Hannukah be a wonderful celebration for you! I love when people have candles in their windows. Always makes the homes look warm and inviting. Thanks for the giveaway. Joanne – White candles especially. Thanks for stopping by. Anzu – Happy holidays to you as well! We had this bell that we hung in the hallway that had a string to pull & it would play Jingle Bells. I now have that & it still works. I remember having my dad pick me up to pull the string. Thanks for the giveaway! Gloria – Awww, what a wonderful memory. Merry Christmas to you! My fav decotation is my stocking because my mother knitted it for me when I was born. It’s a santa face with the beard and other white done in angora yarn so it’s fuzzy. I love it. Happy Holidays! Megan – How special to have something your mother made for you. Makes hanging it such a treat! Merry Christmas to you as well. I don’t have a favorite Christmas decorations right now, but as a little girl I loved one paper chain where each ring showed different pattern. I invented some kind of logical/storytelling game and play with myself for hours :D.
Sylvia – Sounds like you have a wonderful imagination. The only chains we’ve had were the ones my kids made to count down December. I love all those home made decorations that my boy’s made in school and proudly display them every year. Even though my boys are now out of house, I still fill their stockings with goodies for them to enjoy on Christmas day. 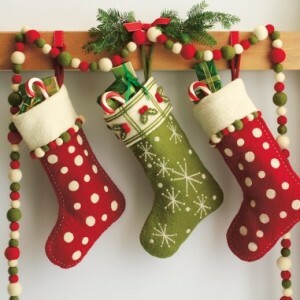 Cathy – I’m glad I’m not the only one who does the whole stocking thing. I love filling them for my kids even though, like yours, mine our adults. Angels decorations for my Christmas tree. Aramis – They sound lovely. Merry Christmas to you also! Jessica – Oh, I’m sorry to hear that. I hope you’ve been able to enjoy the trees at the mall. They’re always so beautiful. It’s what I’m doing to get my fill of holiday decorations this year. We have the tree and then fresh pine ornaments everywhere. Love it. Carrie Ann – Fresh pine ornaments must smell wonderful! I miss that scent. The Nutcracker. I love all the Nutcrackers! I was once a dancer and this was my favorite to dance! Have a Happy Holiday, Nina! Kaye – Oh, I got to see the Nutcracker and just loved it. I can’t imagine dancing it. That really must have been a challenge! I hope you have a wonderful Christmas! Stacey – Oh, that sounds lovely. How fun to stash little things in different stockings. Merry Christmas! My favorites are the decorations that my son has made over the years. Especially the ones with his picture. You can see how much he’s changed over the years. Kim – Oh, I do love the picture trinkets that the kids have made over the years it makes me so sentimental as I display them. Thanks so much for stopping over. My favorite decoration is my little tree that I have on a table in my bedroom. It is covered with miniature ornaments that I have collected from around the world. Nancy – Awww, I love the idea of all the little ornaments especially if you’ve collected them from different places you’ve visited. Merry Christmas! Latisha – I love the lights of the Christmas villages. I hope you have a wonderful Christmas. Thanks for stopping by. Although I’m not a Christian, I still put up a Christmas tree every year. I mean, what’s not to love about Christmas? And my favourite is the Christmas lights. I love the slow twinkling type and just watching them in my darkened living room makes me relax and at peace. Tamsyn – Oh, I do the same with the Christmas tree lights. Just sit the dark with a glass of wine and stare at them with Christmas music playing. It’s so relaxing. Judith – I love strolling down memory lane while I’m decorating the tree! Some of those ornaments are pretty special. Merry Christmas to you! I love christmas trees in the window and driving down the road and the houses being decorated outside with all of the lights. Its so pretty!! Thank you for the wonderful giveaway! Happy holidays! Shadow – I’ve never had a home where I could put the tree in the window, but I do love getting a peek of them through the windows of other people’s homes. Fedora – Oh, aren’t the home made kid ornaments the best? My favorite holiday decorations are the ornaments my son makes every year, I love having the tree filled with them. My other favorite decoration is my willow Tree Navity scene that I recieved from some dear friends as a wedding present. Anne – Oh, willow tree, I have no doubt that nativity set is beautiful. But really, children’s ornaments have that beat hands down in the sentimental heart category! LOL! I don’t decorate that much because I don’t have a lot of storage room, so I keep it simple. I put up my tree and some wreaths outside. My tree is my favorite decoration. Hope to win something while blog hopping. Monica – But a lit tree is so beautiful! I really miss my tree this year! Nothing more special than a beautifully decorated christmas tree!